Bram Stoker and Eisner Award-nominated writer Cullen Bunn (Harrow County, The Sixth Gun, The Empty Man) returns with debut artist Danny Luckert (Haunted) and colorist/letterer Marie Enger (Pistolwhip, 2 Sisters) for a chilling new series in REGRESSION. The new series is set to launch this May. REGRESSION follows Adrian, a man tormented by ghastly waking nightmares. Pushed to a point of desperation, Adrian reluctantly turns to past life regression hypnotherapy as a means of understanding and treating the unwanted visions. When his consciousness is cast back through time, Adrian witnesses a scene of horrific debauchery and diabolism before waking up. But Adrian’s more unsettled than before and something dark and unnatural has followed him back… Now Adrian finds himself descending into a world of occult conspiracy, mystery, reincarnation, and insanity—from which there is no escape. "I think most readers know how much of a horror fiend I am," said Bunn. "What many people don't know is that my father was a professional hypnotist for many years. While it wasn't part of his on-stage act, he often conducted past life regressions. During these sessions I saw people describing other time periods with pinpoint accuracy and even saw someone speaking a language they did not know. I also witnessed some really extremely creepy regressions that planted the seeds for this story of supernatural horror conspiracy." 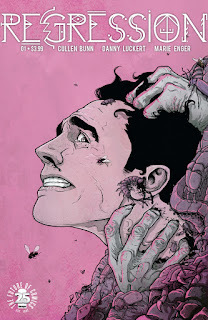 Perfect for fans of Bunn’s critically acclaimed HARROW COUNTY and OUTCAST BY KIRKMAN & AZACETA, REGRESSION is a frightening exploration of the wickedest corners of the untapped psyche. REGRESSION #1 hits stores on Wednesday, May 10th, 2017.